Starting the week off strong, men’s varsity soccer took a 4-1 home game win over Durango on Tuesday, Oct. 9. The first half ended with a 1-0 lead over Durango, but they wouldn’t be beat that easily; they answered back in the second half tying the score 1-1. In a final push the Cougars scored three more goals to secure the win. 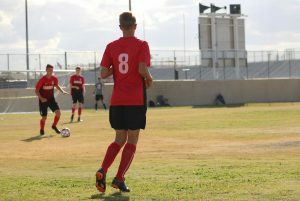 Senior Alfredo Diaz and junior Lincoln Aquino both scored two goals, and with assists from sophomores Taye Adams and Ryan Wilkinson, the Cougars took the win. 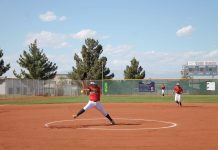 In the second home game of the week, the Cougs dominated 8-0 over Green Valley on Thursday, Oct. 11. After scoring five goals in the first half, the Cougars kept possession and scored three more in the second half. Men’s varsity soccer plays their next home game on Wednesday, Oct. 17 and are 9-0-1 in the league. 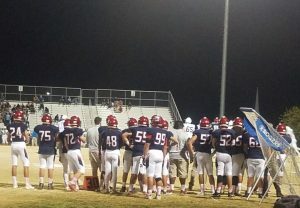 Varsity football lost to the Foothill Falcons 35-7 on Friday, Oct. 12 in the homecoming match. Junior Fullback Vinny Gelsone (34) scored the Coug’s one touchdown off of a completed pass from senior quarterback Keegan Tharp (13). The Falcons overwhelmed the Cougs scoring three touchdowns in the first quarter. Falcon defense continually stopped Coronado from completing passes and making large runs. The Cougs are 1-1 in the league and 3-4 overall. Their next game is at Basic on Friday, Oct. 19 at 7p.m. Varsity’s final home game is against the Liberty Patriots on Friday, Nov. 2 for senior night. 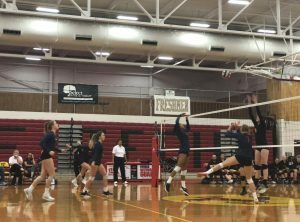 Women’s volleyball swept the SECTA roadrunners on Wednesday, Oct. 10 in three sets: 25-12, 25-5 and 25-12. The Cougs accumulated nine aces, six blocks, 43 digs, and 34 assists. 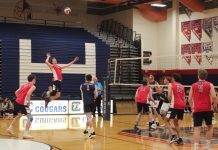 The Cougars now have a 6-2-0 league ratio. “It was an easier match, but we were still able to get better individually and as a team,” Kennedi Steele (2), junior, said. The Cougs play tonight at home against Green Valley in the annual Dig Pink game and again on Thursday Oct.18 at Basic High School. Women’s varsity cross country placed first out of six teams in their final league match of the season on Saturday, Oct. 13 at Basic High School. Junior Claire Rawlins earned second overall while sophomore Erin Shannon placed fourth. Men’s varsity placed second out of six teams, and junior Brendan Graves led the Cougs by placing fifth. The men’s team lost to Green Valley but still beat rivals Foothill and Basic. Cross country’s next meet is on Friday, Oct. 26 at Veterans Memorial Park against 13 other schools for the Desert Regional Meet. Previous articleWhat was your favorite decorative hallway from spirit week? Next articleWhat is the scariest thing thats ever happened to you?